First there was Candid Camera, an amusing television program that gave us the lighter side of human nature as people were caught expressing themselves in various situations, unaware of the hidden camera. They were captured being “real” in harmless situations. And for years we were content. We could sit and watch without blushing, no matter who was in the room: father, mother, grandmother, toddlers. But today Candid Camera is no longer strong enough for the appetites of most television audiences, who hunger for ever-more-edgy entertainment. Despite a recent revival in the United States, Candid Camera is now confined to a lesser-known “family values” network. Feeding the demand for more aggressive television fare these days is a different kind of reality programming. And it came about almost without design. In the early 1990s, MTV stumbled across an idea that caught the interest of a new generation; the network’s hit series Real World has been popular with teens and young adults for a decade now. The show brought together young people who were just starting out on their own, usually in an urban setting. The story line followed the inevitable strains and challenges as their relationships developed in the home. No cash prizes, just real life. In many ways this groundbreaking and surprisingly successful program helped develop an audience that would become the most sought after by advertisers. The ground had been tilled, the seeds planted, but even the producers and networks were surprised by the harvest. Earlier shows like Candid Camera had not borne enough fruit to be classed as a genre. Then a new generation of viewers with lots of money and a thirst for something different arrived—an advertiser’s dream. A whole new category of television developed out of Real World: reality TV. By now, of course, most people are aware of this media phenomenon. The current wave of reality formats began in Europe with the original Big Brother television show in the Netherlands. British television adopted the program, and it quickly gave Channel 4 its highest share of the weekly U.K. television audience in its entire 18-year history. The show, which was based on 10 housemates competing for a £70,000 prize, incorporated the Internet, allowing viewers to log on and see what was happening in the house 24 hours a day and to vote for the one they thought should be evicted from the group each week. The number of offspring and mutations of the reality theme is astounding. After all, how many variations of the basic model can the networks develop? Apparently plenty, and the viewers’ appetite appears to be insatiable. Currently dozens of reality programs air in North America, Britain, Europe and elsewhere, with many more in development. Not only are the shows popular, but so are the numerous Web sites devoted solely to reality television. According to Mark Burnett, pioneer in the latest round of reality television and creator of Survivor, "It's all about economics and commerce." There is no mystery about the market the networks are targeting: viewers between the ages of 18 and 34 with “wallets packed with disposable income.” Blame and criticism regarding reality programming abound, but the simple truth is that people watch. The reality TV formula—be provocative, sensual, voyeuristic and edgy—has proven successful. The question is, who defines the edge—the networks or the viewers? There is no mystery about the market the networks are targeting: viewers between the ages of 18 and 34 with "wallets packed with disposable income." Critics often characterize the shows as exploitative and salacious. The networks, as one might expect, reject this characterization and contend that no one is being exploited and that the shows are simply intended to be “exciting and fun.” Temptation Island, for example, takes “committed” unmarried couples, separates them, and mixes them with invited tempters and temptresses, whose job is to seduce them to commit sexual infidelity. Other reality shows also push the envelope in various directions, each looking for that elusive mix that made Survivor the biggest hit of the decade. NBC Entertainment president Jeff Zucker wore a bullet-proof vest to a recent news conference with television critics as a tongue-in-cheek indication of the flak he expected to take for his network’s summer reality lineup of SPY TV, Fear Factor and Weakest Link. Critics had singled out these programs for their mean-spirited nature and wondered whether NBC’s persona was migrating toward sleazy programming. Zucker’s response was direct and unapologetic: If viewers weren’t watching, these reality shows would quickly be gone and NBC would focus on “quality” TV. The reality, however, is that reality programming is not reality. Burnett admitted that what goes on during Survivor is “completely contrived.” It is obvious when one thinks it through. The situations in which the contestants find themselves are invented, and the ever-present camera influences the actions and decisions of every contestant. Careful casting is also a key element in all “unscripted” reality shows. There is nothing casual or informal about the participant selection process. Fox Television’s Love Cruise started with 3,000 applicants, who were sifted down to the 16 singles selected to cruise the Caribbean in a carefully orchestrated soap opera. Not surprisingly, those selected were young and attractive, and provided the desired volatility for confrontation, emotional roller-coaster rides and, of course, the dumping of contestants one by one with the dreaded thumbs-down vote. Certainly not all reality television is without value. Many see a positive side to the current fare of reality entertainment. Dedicated viewers to Survivor, for instance, claim that even though the first winner employed some underhanded tactics to achieve final victory, most situations in which the contestants find themselves require positive characteristics such as teamwork and cooperation. But in the long run, do these benefits outweigh the potential negative effects on society? If we focus only on the rhetoric surrounding this genre of programming or fall into the trap of simply demonizing the networks, we may be failing to see that reality TV is a symptom of a more serious problem: society’s gradual surrendering of its civility to the darker side of human nature. Previous generations were not ready to see human nature exploited so blatantly by the camera. It would have been considered tasteless. Now it's hip, cool and, most importantly, profitable. The driving force behind reality TV will not go away, even when the current form runs its course. Future shows will be even more shocking, graphic and voyeuristic because of the demands placed on the networks by viewers who require an ever increasing crescendo of sensual stimulation. Previous generations were not ready to see human nature exploited so blatantly by the camera. It would have been considered tasteless. Now it’s hip, cool and, most importantly, profitable. The networks have tapped into a side of human nature that is uncomfortable to acknowledge. This side, when unrestrained, is insatiable. It constantly wants more. When a person yielding to it watches other people performing selfish, heartless acts on network television, a certain approval results—a sense of validation. Not only does reality TV satisfy a voyeuristic tendency in viewers, but when viewers see the contestants doing things they themselves are doing, or wishing they could do, it somehow justifies their own poor choices. Of course, the bar must constantly be lowered to satisfy the viewer, and the media willingly comply for the sake of revenue. An entire industry of home video products that would never make it past the censors for television, even pay television, is making some daring television producers very wealthy. The term “ringside seats” harks back to a much earlier time. 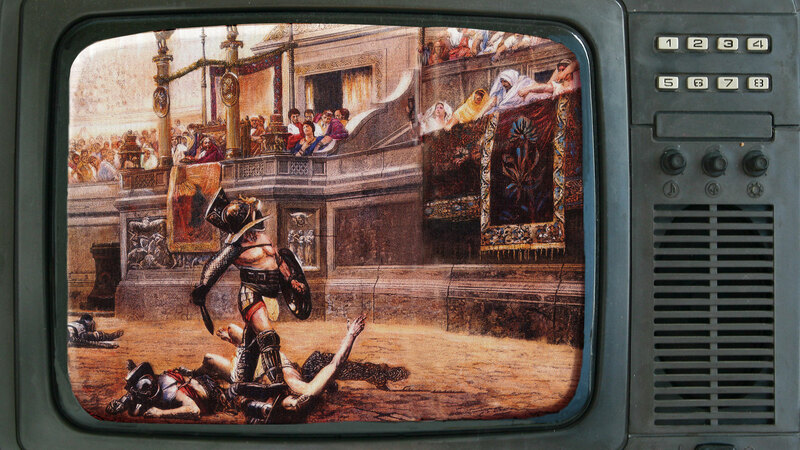 The evolution of entertainment in Western society is similar to that of the Colosseum at Rome. We can only hope that 15 Minutes will remain fictional and that today’s audiences will never approve of actual killing in the arena of entertainment. But some of the shows that are springing up have the same gruesome appeal. An entire industry of home video products that would never make it past the censors for television, even pay television, is making some daring television producers very wealthy. The late-night shows are littered with ads for these videos with the common sales line, “too intense,” “too graphic” or “too risqué” to show on television. And now MTV has another hit on its hands. It’s called Jackass, and it features home videos of people performing very dangerous stunts, such as riding bicycles off housetops or setting themselves on fire. Its appeal to viewers is seeing people get hurt or come close to being killed. It is most popular with teens and preteens. Is another generation of insatiable television viewers being cultivated? Think of it: If Jackass is their starting point, what kind of reality programming will it take to hold their interest in 10 or 20 years? Video Gaming: Harmless Hobby or Health Hazard?